December Photo of the Month Winner! Thread: December Photo of the Month Winner! Congratulations John on your winning image! I love this couple in my tank. The tiger pistol shrimp and Yellow Watchman goby pair are a wonder to watch. I named this image "Ever Vigilant" after the ever watchful eyes of the goby. It is rare to ever see the two apart. Whenever the pair leave the fortress, which they are always modifying, the shrimp always keeps a whisker, antenna, feeler, or what have you touching the watchman, ready to bolt back to the lair. I was lucky enough to have the shrimp make their home close to the front of the glass. The side of their home is the front wall of the fish tank. This gives a wonderful view into their lives beneath the sand. The two creatures are amazing to watch, if you can stay still enough. I must say that congratulations are definately in order for that picture perfect shot that you got John. I know you must have been thrilled to death to finally be given an opportunity to catch them in action. I can plainly see how they have managed to capture your heart and maintain your fascination and appreciation for them. Kudos to your winning efforts! One new reefer, another voice united with the many against ignorance and greed. Educate, influence, good stewardship, all in one accord to work together as a whole in saving our reefs. Thats an awesome picture, wish my pistol shrimp did that! Great colour, nice work! Love the pic. 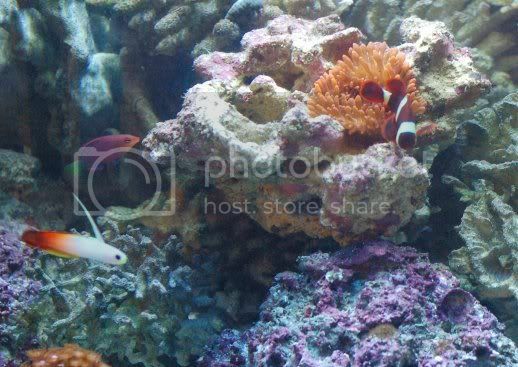 I have a pink and blue spotted watchman goby but I havent gotten a shrimp to go with him yet. That is great. I want to pair my watchman goby with the same type of pistol shrimp that you have. I love that kind. incredible picture, Amazing detail, a well deserved win Love the goby his coloration is fantastic as is the pistol shrimp. That is a amazing picture. I am envious of your privilege of getting to see that first hand. 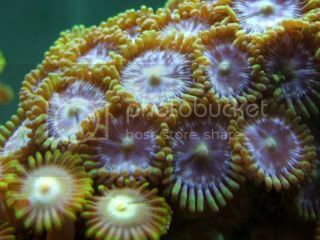 It is symbiotic relationships like that, that brought my interest into the hobby. The problem is not to manage the reefs but to manage human population and their activities. Gratz! I really love this picture! That is a beautiful photo. The story behind the two makes it even more special and more to appreciate. Thanks for sharing the story. That is a great picture. It’s from the last photo of the month contest we had - December ’08. Why is there no longer a POTM contest? Not really sure. I think anyone that wants to step up and organize it would be welcomed by the Mods. Because with the holidays it took up most of our time and because after a couple months participation went down. I will ask the other mods and see if they want to bring it back but I don't think it will be monthly.